The hotel’s services are many and they will definitely please all its visitors. The guests will be absolutely thrilled with the Grand Pool of the hotel with the mesmerizing view and the small bridges that lead to the Pool Restaurant. There is also a children’s playground near the hotel’s pool bar with a slide and swings. Moreover for those guests who need to stay in touch with the rest of the world, the hotel provides an internet corner with computers that is free of charge. Apart from the Pool Restaurant and the Pool Bar the hotel proudly features two more restaurants and one more bar. The Aquarium Restaurant and the Olive Leaf Restaurant are two exquisite restaurants that serve fine dishes. The Peacock Bar is a modern area where the guests of the hotel can sit back and enjoy their coffee or their drink. 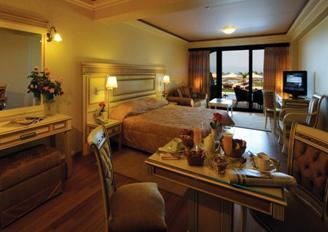 There are of course many areas in the hotel’s premises where guests can enjoy relaxing and pleasant moments. The Thalasso Therapy Centre of Kandia’s Castle, with the two indoor swimming pools, offers therapies and spa facilities that will rejuvenate mind and body. The experience staff of the wellness centre will do everything in their power to make you feel refreshed and revitalized. Kantia’s Castle is also fully equipped for conventions and celebrations. The hotel’s Conference Hall with the modern facilities can host up to four hundred people. The hotel’s Meeting Room is equipped with modern facilities and it can host approximately thirty people. The rooms of the hotel feature marble bathrooms and Jacuzzi baths, they are decorated with beautiful furniture, fine linen and offer modern facilities. All the hotel rooms provide luxurious accommodation and offer private bathrooms with toilette accessories, bathrobes, slippers and hairdryer. Furthermore all the rooms have air condition, heating, television, safety box, wireless internet connection, mini bar and work desk. The deluxe rooms and the executive suites of the hotel offer a private swimming pool for those who prefer to have seclusion. Kandia’s Castle is the perfect sanctuary for holidays and relaxation. The experienced hotel personnel will make your stay in Kandia’s Castle memorable.